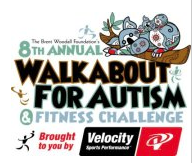 "The Walkabout for Autism is a family event designed to promote Autism awareness and raise money for the Brent Woodall Foundation for Exceptional Children. The mission of the BWF is to empower parents of children with autism by providing educational training, customized academic and behavioral plans, psychological assessments, and modest financial support. Stop along the trail to test your physical strength and endurance. Personal trainers from Velocity Sports Performance will guide you through physical challenges for the chance to win prizes! Kids can do it too! Our team of Assistant Therapists will assist the kids in modified exercises. Adults and kids will win prizes for competing in each challenge! Join us at our KIDS ZONE for a bounce house, bike rodeo, face painting, and prizes!" I loved doing the Walk About for Autism. I walked around Andy Brown East and did the velocity 'fitness challenge.' There were five stations that included push up, sit up, jumping and squatting competitions. Beforehand, the president of the beneficiary - the Brent Woodall Foundation - talked about how they help families with Autism in so many ways. Not to mention, I came home with a ton of free stuff! I volunteered at the walk for NHS and also for this class. I worked at the bounce house and it's a good way to raise money for the educational program and it was good to see some kids who have autism and knowing that they can express themselves. I really enjoyed the Walkabout for Autism! The staff working there were very kind and willing to help with anything you needed. It was great to see a significant amount of people show up too! The best part about the actual walk though, and what I thought was most interesting was that they had little signs stuck in the ground every 50 feet or so around Andrew Brown East park providing facts and information about Autism and how people with Autism are helped by being provided a life that will help them feel like they fit in with society and how they are helped in the real world. I woke up Saturday morning forgetting about the run so I biked to Andy Brown as fast as I could and I made it just in time for the walk. I learned a lot about autism because of all the facts posted along the trail. It was a really fun event and I met a lot of children with autism and there parents. Mostly due to the fact that I was going the wrong way on the trail... But overall, it was very very fun. The Walkabout for Autism was really fun and enjoyable. I had a good time thanks to the friendly staff and with the people that attended. This was my first time attending such an event so I thought it was interesting. I learned a lot of new facts about autism that were posted around the trail. Although it was pretty hot and the event was way too early for me I had a lot of fun! I thought the whole concept of the run was for a great cause. I do believe that its good to inform the community about autism, especially in fun, innovative ways. I thought it was very smart the way they had the facts posted on signs throughout the run. The fitness challenge hosted by velocity was pretty amazing as well (although I did not participate in it). It a good way to gain more people to support the cause,as well as the amazing raffle prizes at the end. Overall, I the Walk About for Autism was pretty nice. I had so much fun a this walk!! The fitness challenge was so much fun and I liked that I was working out for a cause. The crowd was handled well and everyone was in high spirits. I defiantly want to participate again. This past Saturday I participated in the Walk About For Autism at Andy Brown Central. The event started at eight am when they served us breakfast and started giving background information on what we were fundraising for. The money raised from the walk goes to an organization that helps those with autism and provides for families who have someone autistic in them. it was a really fun event and a great way to get involved. The Walk About for Autism was so much fun, and I am really glad I was able to participate in it! The fitness challenge that they had was so much fun to do, especially when we were able to watch and cheer on kids that actually had autism. I also really liked how they had signs staked in the ground along the trail, telling all sorts of different things about autism- they were really interesting! Overall, the Walk About was very fun, and I would definitely do it again! The Walk for Autism was such a great opportunity and experience! I loved the fitness challenge because it allowed me to do something other than just walking the course. I learned so much about autism and the people it affects by simply participating. I would definitely do this walk again because it was so well thought-out and organized! I had the privilege of filming this event for KCBY, I met plenty of wonderful people who were able to tell me their stories about the loved ones who they were walking for. The Brent Woodall foundation truly is a great program who reaches out to families who are in need, and supplies their children who have Autism with what would be intensive and costly therapy. The Brent Woodall foundation sponsors this event every year. This is the url for my picture.